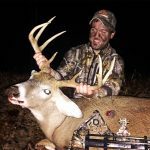 Habitat Podcast #33 we have Chad Thelen from Stoney Creek Outdoor Properties. Get ready for some INFORMATION! The Early Successional Habitat Challenge with Craig Harper and QDMA. Program Payouts & much more!